The coyotes were active behind my place a couple of nights ago and the trail cam captured some of the activity. There is a fence along the back that “funnels” wildlife through the woodlot in the back . I put the cam up facing a spot where there is a confluence of trails and – got lucky. There were three or more coyotes exploring the fence itself. I checked later and found nothing that told me what attracted them to the area. Oh to have the nose and ears of a coyote (well, at least for an hour or so!). 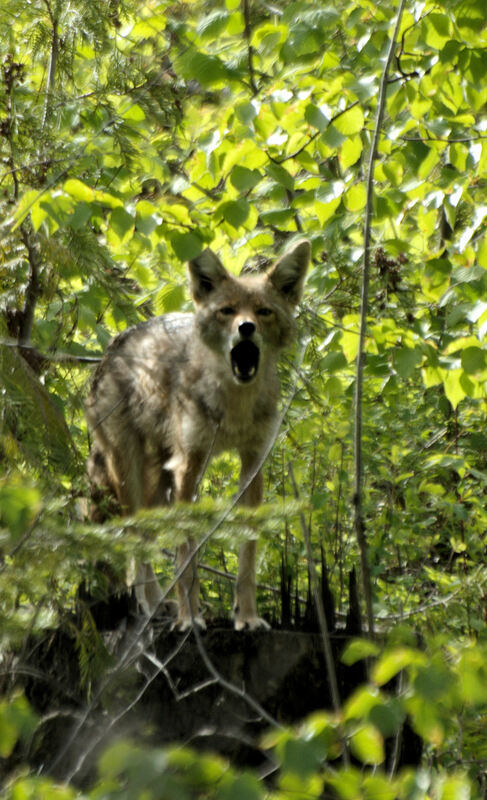 Coyotes sometimes work together to drive animals, like grouse, into the fence to trap them. Perhaps these coyotes were exploring that possibility. About four years ago I recorded the video below with an Cannon Sureshot camera. Max, my German Shepherd, and I encountered coyotes frequently along the powerline pictured in the video below. The coyote calling in the video actually called the entire time we were in that location – for about 5 minutes. The next year, Max and I continued to have encounters with coyotes in that area. The photo below is of a coyote that was within about 40feet of Max and me, calling and staring at us. Later that year I saw the coyote pups below playing on the road. A Coyote withing 50 feet of Max and me – calling a warning. And finally – a wildlife cam (not a great camera in this case) captured a coyote (looking skinny in it’s summer coat) eating cherries under the road last year. I had put the wildlife cam to capture bears eating the cherries – but found out that coyotes like cherries too! The world at night is filled with wildlife that we don’t see in the day. I am enjoying using the trail cams – stay tuned for more videos. All photos, videos and writing copyright J.A. Siderius, 2013. I’m loving these coyote videos. It’s funny because since your previous post on coyotes we’ve been hearing some calls in the woods. Our neighbor told us he saw one running up the fairway in our back yard. I love the pup photo! Coyotes are adapting well. We have had an intensive and extensive affect on the continent and coyotes have accompanied us on that journey. For better or worse!